It has been noted that around 154 thousand people thronged the Ancol Taman Impian during Eid holiday since Friday (6/15) and Saturday (6/16).
" Yesterday there were 101 thousand visitors crowded Ancol. And today until 2 PM, there have been 78,540 visitors"
It is targeted to touch 1,152 million visitors until Sunday (6/24). 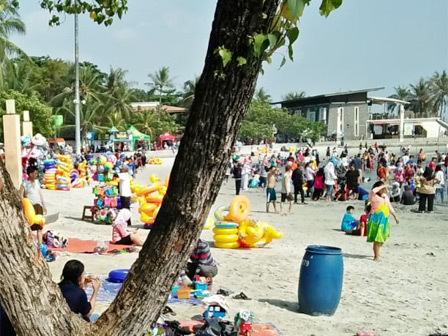 Ancol Taman Impian's Corporate Communication, Rika Lestari said, trend of visitors during Eid holiday began to increase significantly, since the first day of Eid. It is noted that on Friday (6/15) where its number hit 53 thousand visitors. "Yesterday there were 101 thousand visitors crowded Ancol. And today until 2 PM, there have been 78,540 visitors," he told, Sunday (6/17). In overall, she assessed the number of visitors since D-1 was 200 thousand people. Until D+5, his target during Eid holiday could be achieved. In future, ondel-ondel parade in Ancol Lagoon and ondel-ondel underwater performance at Sea World as a series of city's anniversary is predictably able to attract visitors. Along Eid holiday, her side already has traffic engineering and parking lot for visitors. For security level, 266 officers who consist of security officers and life guards have been prepared for 24 hours. The number was added with 52 tour fishermen along the waters of Ancol as the security of coastal areas. "Especially for swimming area, a net has been installed at the beach pool to filter out garbage or something. Not only security, janitors were also added to ensure the beach area is clean," she said.